If you missed it, dozens of screaming women, some costumed, were dragged from the confirmation hearings. Democrat senators, who egged on the zany demonstrators, interrupted the initial proceedings themselves more than 75 times. Outside the hearing, a “Code Pink” man wearing a head-to-toe condom emblazoned with “Men for Choice” roamed the halls in a performance that failed to attract reporters. He did not fit the media narrative framing Republicans as the lunatic threat to the republic. Progressives have good reason to worry. President Donald Trump’s first Supreme Court appointment of a constitutional conservative, Neil Gorsuch, has already borne fruit. Seated on April 10, 2017, Justice Gorsuch has voted consistently as a strict originalist. That means he takes the Constitution as written and not how it has been twisted by courts over the years. 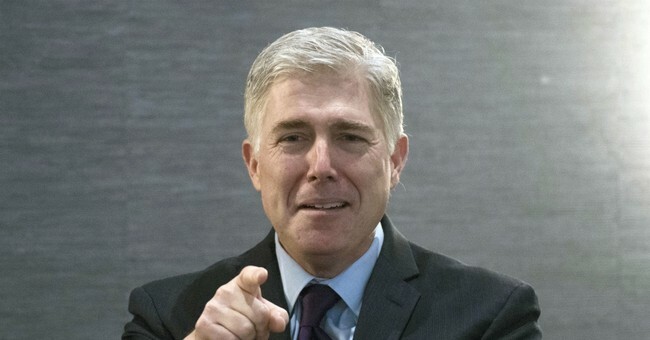 “During his short tenure so far on the bench,” wrote Ken Klukowski, general counsel of the American Civil Rights Union, “Gorsuch has proven himself a strictly principled jurist who had not deviated even once from the original public meaning of any provision in the Constitution or federal law.” Oh, the horror. For the Left and the media, which depend heavily on the courts to impose socialism and sexual anarchy, the prospect of another Gorsuch merits an Armageddon-level response. A 5-4 conservative majority on the Court will no longer rubberstamp the Left’s radical agenda and may even begin to reverse some of it. No wonder they’ve become unglued. The government exists to serve the people, not the other way around. On the handwritten copy of the Constitution, ratified 231 years ago on Sept. 17, 1787, the Preamble begins with We the People – not We the Ruling Elites – in larger letters than the rest of the text. In recent years, the Preamble has been misused, however, as an excuse to expand federal power. It outlines broad objectives for the government, but the Preamble does not confer any authority whatever. That is left to the articles that list the various powers of each branch and of the states. Despite clear direction from the Founders that the Constitution is to serve as a check on government, the phrase “promote the general Welfare” has been a blank check for increasing centralized power. In some areas -- particularly in family law -- abuse of the Constitution by so-called civil liberty groups has facilitated moral breakdown and dependency. They have traded the Founders’ Biblically- and family-grounded worldview for a secularized, libertine model of human beings as detached individuals rather than as mothers and fathers, sons and daughters, brothers and sisters, grandmothers and grandfathers, uncles and aunts and as members of organically-connected communities. As Marx and Engels opined, the family and church must be eliminated as competitors to the socialist state. Without God, as John Adams noted, a limited government cannot work because citizens would not have enough self-control. The less personal responsibility, the more we need bureaucrats, programs, police, prosecutors and prisons, plus academics to study it all. Which, except for the cops, whom they clearly disdain, is how the progressives like it. It’s why they will fight to the death to keep the Supreme Court – and the Constitution -- from thwarting their plan to fundamentally transform America. They probably can’t stop Judge Kavanaugh’s confirmation, but they hope to make enough noise to motivate their voters to flip at least one house of Congress in November. Their success or failure – and that of the Trump Administration -- will depend on which base turns out. Robert Knight is a Townhall contributor. His latest book is “A Strong Constitution: What Would American Look Like If We Followed the Law” (djkm.org, 2018).